Lettuce is susceptible to various fungal (Septoria lactucae, Cercospora longissima, Microdochium panattonianum) and bacterial (Xanthomonas campestris pv. vitians) leaf spots. Because the leaf is the harvested product, leaf spots can cause considerable damage under the right environmental conditions. Septoria lactucae occurs worldwide and becomes important under prolonged high humidity and frequent rainfall. Cercospora leaf spot is seldom destructive except in the tropics and subtropics. Microdochium panattonianum is also known as anthracnose, shot-hole, and rust. The pathogen is distributed worldwide and can cause considerable losses when conditions are cool and moist. Bacterial leaf spot can cause serious losses in the United Sates. 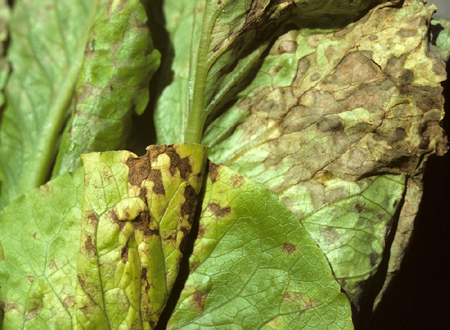 Symptoms of S. lactucae generally start on oldest leaves and consist of small, irregular chlorotic spots. Lesions enlarge, turn brown, dry out and may fall out giving the leaves a tattered appearance. Numerous fruiting bodies (pycnidia) develop with leaf spots. Symptoms of bacterial leaf spot start as small brown spots with chlorotic haloes occurring on the lower leaves first. The disease spreads upward and lesions become sunken and necrotic. Symptoms of anthracnose (M. panttonianum) first appear as tan, water-soaked lesions on the midrib of outermost leaves. Lesions expand, become straw colored, and the centers fall out. Severe infections affect head formation and may be invaded by secondary rotting organisms. S. lactucae survives in lettuce seed, crop debris, and on wild lettuce hosts. Anthracnose survives in infected crop debris or as microsclerotia in soil. Spread is primarily by splashing water. Like the fungal leaf spots, X. campestris pv. vitians is dependent on cool moist conditions to cause disease. The bacteria may be seed-borne (infrequently), survive in the soil for several months, or persist on wild lettuce hosts. Examine transplants and remove infected plants. Avoid overhead irrigation if possible and minimize periods of leaf wetness by reducing plant density, irrigating in the morning, and orienting rows with prevailing winds. Plow plant debris under after harvest to hasten decomposition. Avoid working in fields when plants are wet. Copper bactericides are of limited effectiveness in controlling X.c. pv.vitians. Sanitation and environmental manipulation are important disease management principles.